Chairman of new 'Israeli Resilience' party gives first speech at launching of campaign, slams 'evil' in current government. 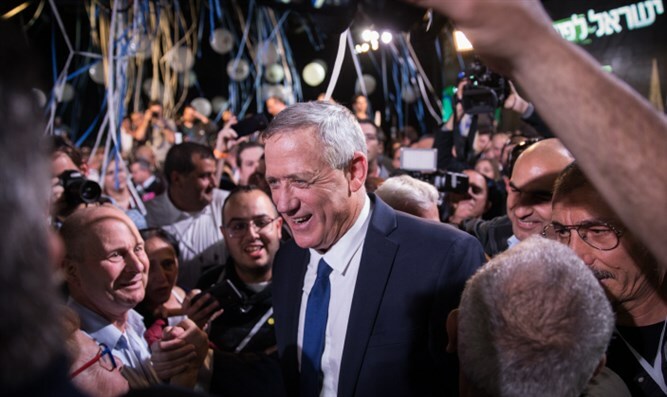 Former IDF Chief of Staff Benny Gantz delivered his first political speech at the launching of his party's campaign Tuesday night. "I love Israel, I am proud of it and committed to it. For me Israel is really first of all, the citizens of Israel, from you I come, to you I return, and only to you I am committed. The people of Israel is a great story. It is bigger than any leader," Gantz said. "I came here tonight also because I am worried about Israel. The people are strong, the country is wonderful, but in Israel there is an evil spirit, mutual responsibility is crumbling, politics are ugly. Ganz attacked the prime minister, "I am proud of our country, I will never be ashamed of it, but lately, more and more people, on the right and left, feel embarrassed by the way our leadership behaves. The time has come for unified leadership, for cohesion, a way of behaving differently, which is not concerned only with itself." "The current regime encourages incitement and subversion instead of serving the people. The government looms over the people, the people that bore [Prime Minister Netanyahu]. It does not see the families groaning under the cost of living, nor the young people who cannot buy an apartment. Ganz declared his intention to run for prime minister and promised, "On April 9 I will establish a government, a government of power, a government of responsibility and firmness, a responsible government that is concerned about security and not intensifying anxieties." "We will preserve the responsibility for security throughout the Land of Israel, but we can not turn us into a bi-national state," Gantz said, referring to his political plan, "We will preserve the Golan Heights, which will remain in our hands forever. And Jerusalem will remain forever the capital of the State of Israel and the Jewish people." Earlier, it was announced that the Hosen Yisrael (Israeli Resilience) party, headed by former IDF Chief of Staff Benny Gantz, and the Telem party headed by former Chief of Staff and ex-Defense Minister Moshe Ya'alon agreed to run on a joint list for the upcoming Knesset elections in April.